The Starkville Foundation for Public Education and Starkville Oktibbeha Consolidated School District honored three outstanding alumni of Starkville High School as 2016 inductees into the school’s Hall of Famous. 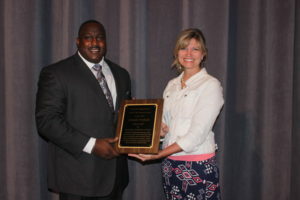 Starkville Police Chief Frank Nichols, Class of 1987; computer engineer Christine Cuicchi, Class of 1990; and attorney Jay Perry, Class of 1990; were officially inducted into the 2016 SHS Hall of Famous during a ceremony at the Greensboro Center on October 11. Friends and family of the inductees joined the Foundation and the District for the awards program to celebrate the distinguished careers and achievements of the Hall’s Class of 2016. Chief Frank Nichols, who holds a Bachelor of Science degree from Mississippi State University and a Master of Science degree in criminal justice from Troy University, is also a graduate of the Federal Bureau of Investigation National Academy and Mississippi Command College. He has distinguished himself as a servant to his country and his community since graduating from Starkville High School in 1987. Most recently, Chief Nichols was honored with the 2016 Community Achievement Award and 2014 Lifetime Achievement Award from the NAACP as Starkville’s first African American Police Chief. Chief Nichols joined the Starkville Police Department in 1999 as a patrol officer after he completed a tour of duty in Operation Desert Shield while enlisted in the United States Navy. Chief Nichols also served his country in the United States Army National Guard during Operation Iraqi Freedom. For his service to his country, Chief Nichols has earned 11 awards and honors including Army Commendation Medal, Iraq Campaign Medal, Global War on Terrorism Service Medal, and National Defense Service Medal. Chief Nichols rose through the ranks of the Starkville Police Department from officer to sergeant to lieutenant to captain. A former DARE officer at Henderson and Armstrong Middle School, Chief Nichols has worked to educate students about the dangers of drugs and alcohol and to offer them encouragement and advice about how to respond to peer pressure. Currently, Chief Nichols is also a lecturer and adjunct instructor in the field of criminology at Mississippi State University. Chief Nichols is also active in his church, Bethel Missionary Baptist, where he serves as a trustee. He has two sons, Reynolds and Jaxsen, who attend the Starkville Oktibbeha Consolidated School District. Christine Cuicchi received her Bachelor of Science Aerospace Engineering and Master of Science Computational Engineering from Mississippi State University. She is currently the associate director for the Department of Defense High Performance Computing Centers where she oversees a staff of 350 and a user population of almost 4,000. 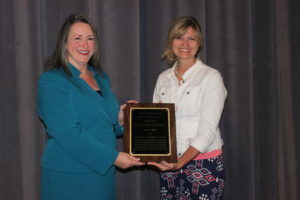 Christine is the first woman to lead this national network of five supercomputing centers that support the unclassified and classified needs of the Department of Defense Research and Development community. The HPC Centers Christine manages also assist scientists and researchers to enable discoveries in areas such as blast protection for forces, aircraft and ship design, weapons design, and hypersonic flight, which benefit DOD and the United States. Christine has been honored as an HPC Hero for Innovative Practices, and she’s received the Navy Performance Award 13 times since 2000 including 9 consecutive years since 2007. In 2006, she was awarded the Armed Forces Civilian Service Medal for her service to the Armed Forces in the aftermath of Hurricane Katrina. Christine, who has never forgotten the influence of her educational experience at Starkville High School, is an advocate for STEM programs. Since 2007 she has volunteered to organize a regional scientific quiz bowl competition for the National Ocean Sciences Bowl, and since 2013, Christine has served as a member of the Computer Science and Engineering Advisory Board at Mississippi State University where she provides feedback regarding department performance and strategic planning. Christine is the second member of her family to be inducted into the SHS Hall of Famous. 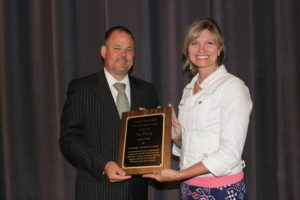 She joins her father, long-time SHS physics teacher Dr. Paul Cuicchi, who was inducted into the Hall in 2011. Jay Perry received a Bachelor of Arts from Mississippi State University and a Juris Doctor from the University of Mississippi. An accomplished attorney and founding shareholder with the law firm Perry, Winfield and Wolfe, P.A., Jay has argued cases before the Mississippi Supreme Court and the United States Fifth Circuit Court of Appeals. He’s served as a member of the Plaintiffs’ Steering Committee in reference to managed care litigation in the United States District Court for the Southern District of Florida, Miami Division, and he was listed in The Best Lawyers in America for four consecutive years from 2010 to 2013. In addition to his distinguished law career, Jay is a broadcaster for the SEC Network. Jay works closely with junior and senior college athletic departments, and he’s a frequent lecturer to athletes regarding leadership and choices in today’s intercollegiate environment. Since returning home to Starkville in 2004, Jay has been a tremendous advocate for the Starkville community and the Starkville Oktibbeha School District. Jay has served as board member and campaign chair for United Way of North Central Mississippi, president of the Oktibbeha County chapter of the Mississippi State University Alumni Association, and MSU Department of Communication Advisory Board member. Jay’s determined spirit and strong commitment to the continued success of SOCSD cannot be understated, and it’s his enthusiastic support as a staunch advocate for the Jacket nation and Starkville’s public schools that really demonstrates the significance of his contributions to his alma mater. Jay and his wife Jamie are actively involved in PTO and Parents for Public Schools. Jay has led the efforts of athletic booster clubs in support of Yellow Jacket student athletes and programs, and he’s the voice of the Yellow Jackets for Starkville High School football. Jay has worked tirelessly to garner support for consolidation, including the construction of the first ever Partnership School on the campus of MSU, that will house all sixth and seventh grade students when it opens in 2018. He’s engaged leaders on both local and state levels, and he’s served on numerous committees in official and unofficial capacities, including the District’s Bi-Racial committee, strategic planning team, and search committees for high school football coach and assistant superintendent. Jay and Jamie have three sons, Jack, Banks and Larkin who are students in the Starkville Oktibbeha Consolidated School District. They are active members of the Episcopal Church of the Resurrection where Jay served as Senior Warden for three years.